BBC News reports researchers at Caltech and Harvard University have managed to create an artificial jellyfish using silicone as a base on which to grow heart muscle cells that were harvested from rats. 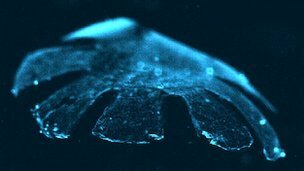 Using an electric current, they managed to shock the muscle cells into swimming similar to a real jellyfish. The research holds promise for the creation of muscular organs and simple life forms. "I was surprised that with relatively few components - a silicone base and cells that we arranged - we were able to reproduce some pretty complex swimming and feeding behaviours that you see in biological jellyfish," said John Dabiri, professor of aeronautics and bioengineering at Caltech. The team aims to carry out further work on the artificial jellyfish. They want to make adjustments that will allow it to turn and move in a particular direction. They also plan to incorporate a simple "brain" so it can respond to its environment and replicate more advanced behaviours like moving towards a light source and seeking energy or food.